HarapekoDoggyBag Bloggy: Tuesday is Curry Day! 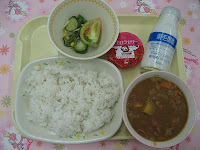 A curry rice set menu lunch at a Japanese elementary school. 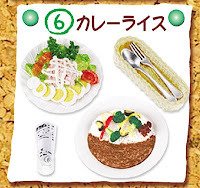 Re-ment 2009: #6 of "Hello Kitty: My Food"
Re-ment 2008: #8 of "World Airline Meals"
Re-ment 2008: #9 of "Family Get-together Meals"
Re-ment 2008: #3 of "Spoon Mascot"
Re-ment 2007: #5 of "Shop Food Display"
Re-ment 2006: #6 of "Everyone at the Family Restaurant"
Re-ment 2005: #5 of "Is Dinner Ready Yet?!" Re-ment 2002: #1 of "Family Restaurant"
Japanese curry has been a popular dish since it was popularised in the Showa Period or the 1960s. 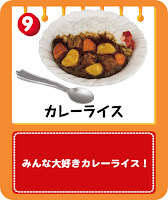 Ever so much that kids across the nation have ranked "curry rice" as one of the top 3 (this can be disputed...if you are game enough and can play janken well!) dishes for their monthly school lunch menu. Domiciles are not immune to the curry fever. 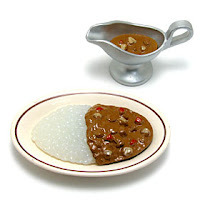 Tuesdays or 'ka-yobi' (火曜日) are nominated by some housewives as the curry rice day. The 'ka' (火) being similar in sound to the 'ka' (カ) of curry in katakana (カレー). 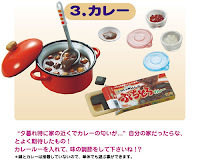 Re-ment has produced curry themed miniature dishes 9 times to count, exemplifying how prominent curry is in everyday life and as well as in the Japanese diet. 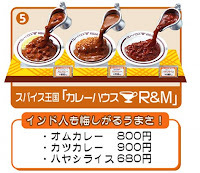 If you ever want to sample famous and tasty Japanese curry try ones from these companies! Once you try these, there's not going back to eating plain rice!